Mirroring is one of the opporations you may want to perform on your shape to flip it in the correct orientation. 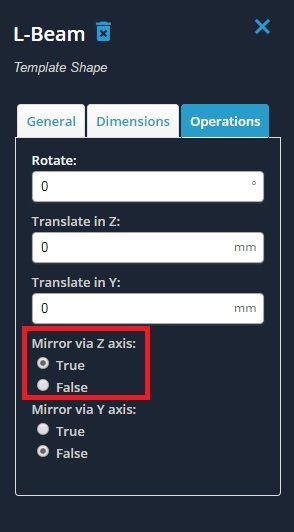 Mirrors can be done about the Z axis (horizontal) or about the Y axis (vertical). Note that the mirror is always performed about a line parallel to said axis, passing through the centroid of the shape. To perform a mirror, simply click that shape you wish to mirror. In the menu that appears on the right, click the 'Operations' tab. If you wish to perform a horizontal mirror (i.e. about an imaginary horizontal line that passes through the centroid), then click 'True' under 'Mirror via Z axis'. Similarly, if you wish to perform a vertical mirror (i.e. about an imaginary vertical line that passes through the centroid), then click 'True' under 'Mirror via Y axis'.